"Scary events unfold as malevolent hackers attack"
Told in the present tense, this thriller looks at a scenario involving cyber terrorism. A group of recruited hackers from chaotic nations are writing bugs to take down everything from planes to dams across the United States. The CYBER ATTACK is aimed at causing the greatest possible chaos, sometimes achieved just by darkening the energy grid. Paige and Hank are two anti-terrorist operatives, and we first meet them at the National Cyber Investigative Joint Task Force Operations Center, McLean, Virginia. FBI Special Agent Hank Goodnight is paired up with Paige Randall who is a programmer, after reports come in of escalating chaos. A plane down, a nuclear plant on high alert... what more could be waiting for the planned time to fail? In reality, more than two agents would be sent to counter such high profile and potentially devastating disasters. The FBI would probably drop everything else. But this is fiction, and by following one pair through the book, winding their way between chapters of once-seen ordinary people getting swept away by floods, we can see the kind of work such agents would be required to do, while getting to know them a little. Some of the comments made in the book are quite cynical. For instance, Hank says the cellphone companies resisted installing backup power on cell masts because customers pay per month, not per call. We see the results as cellphones can't find a signal and credit card lines, e-mail and the rest are out as well. Peyton Lynch, Paige's sister, is stuck in Chicago. Through her story, we see how tough life becomes for an ordinary person. The tally of disaster continues to rise. This story isn't for the tender. I quickly got to dislike being introduced to folks who were in the story solely to die, like a horror story. Do missiles sitting in racks actually spontaneously connect their guidance computers to the local wi-fi network? How would they know the sign-in code? I am sure the author is piling incidents in to make us realise that one or another could occur. We also see the brief backstory of the motley crew of hackers, like Yuusef whose family in Somalia were unintended targets of a drone missile. This is still told in present tense, but in italics to differentiate the past tale from today. 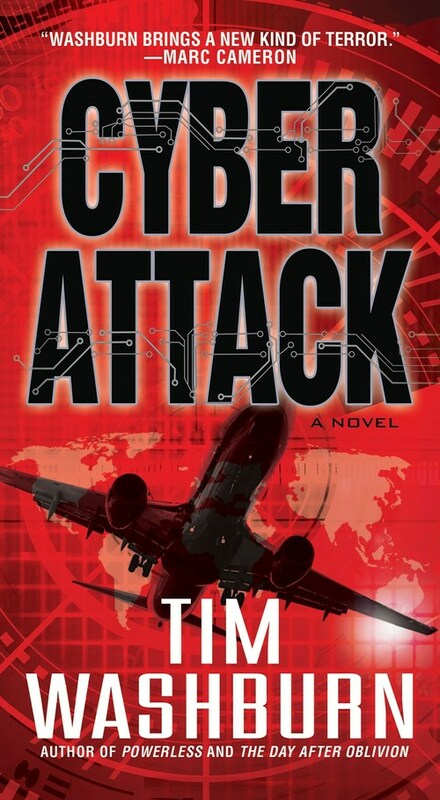 All told, this is a scary and exciting book, by Tim Washburn, who convinces us that a CYBER ATTACK could be just around the corner. Make sure you have strong shoes, a flashlight and water before you start reading.